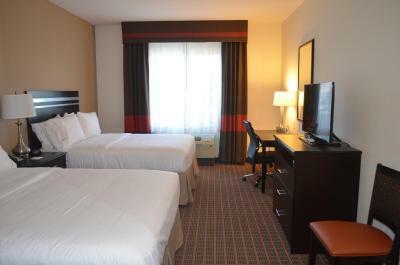 Lock in a great price for Holiday Inn Express & Suites Golden – rated 8.7 by recent guests! Good breakfast. Excellent front desk staff. Very convenient location with quick access to highways to access the airport, downtown, and the mountains. The staff was very accommodating and the facility was clean. Nice stay- hotel was very clean, the beds/pillows were comfortable and staff were polite. We stayed for one night on the way to Winter Park (didn't want to drive through the pass at night and in snow) , worked really well for this as it is less than a couple of miles off I-70. The breakfast was great, the beds were comfortable, and the rooms were clean. I felt it was excellent value-for-money. We were driven to the hotel by a blinding snowstorm, and we're unable to get to our mountain destination up I-70. This was a great refuge from the storm and a safe place to spend the night. Staff very friendly. Complimentary breakfast was great with a wonderful selection. Staff was great, and breakfast was awesome! It's complementary and they have Cinabun cinnamon rolls! Very comfortable spacious room. Outstanding breakfast with friendly and helpful staff always available. Nice clean room with comfortable beds. View of the mountain. Staff, Facilities, Location. Everything came together to make our two night stay a pleasant one. The pool & spa. Comfortable & roomy room. Enough plugins for all our devices. Good breakfasts, but not much variety. Everything was very nice and clean, and all the staff were very friendly and helpful!! Holiday Inn Express & Suites Golden This rating is a reflection of how the property compares to the industry standard when it comes to price, facilities and services available. It's based on a self-evaluation by the property. Use this rating to help choose your stay! Featuring a heated indoor pool and a hot tub, Holiday Inn Express & Suites Golden is 10 minutes’ drive from Red Rocks Park & Amphitheater. Free WiFi is provided. A free breakfast buffet is served daily. 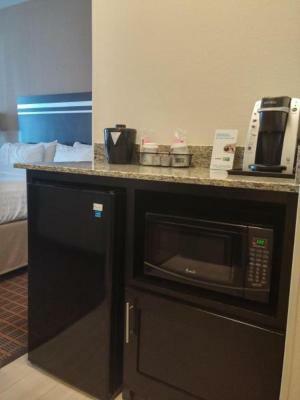 A seating area with a work desk, a flat-screen cable TV and a microwave are offered in each air-conditioned room at Holiday Inn Express & Suites Golden. An private bathroom is also included. A 24-hour fitness center is available at Golden Holiday Inn Express & Suites. Free parking is provided. Dinosaur Ridge is 2.3 mi from Holiday Inn Express & Suites Golden, while Coors Brewery is 2.7 mi from the property. The nearest airport is Denver International Airport, 29 mi from the property. 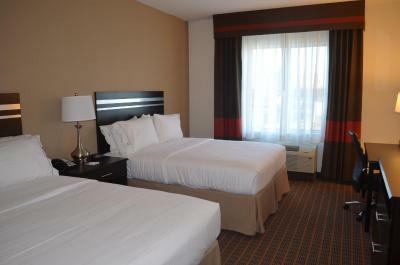 When would you like to stay at Holiday Inn Express & Suites Golden? 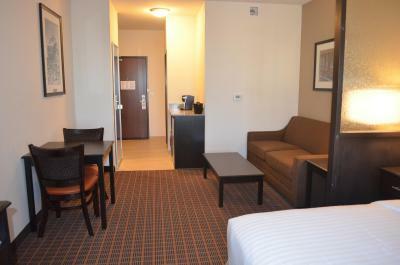 A seating area with a work desk, a flat-screen cable TV and a microwave are offered in this air-conditioned room. An private bathroom is also included. Welcome to the new Holiday Inn Express Hotel and Suites Denver West - Golden hotel with its colorful backdrop of the Colorado Rockies. 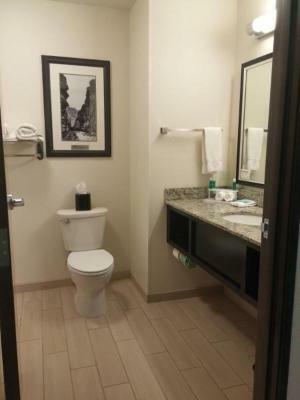 This location allows for convenience whether you are needing to work or looking to relax. Both business and leisure travelers will benefit from the proximity of the Holiday Inn Express Hotel and Suites Golden as Downtown Denver and the Denver International Airport are only minutes away. Conveniently located near the highway, enjoy a plethora of surrounding activities and attractions. Our 100% smoke free facility has an indoor heated pool and hot tub. Enjoy your workout in our 24 hour fitness center, and the convenience of our on-site guest laundry. Guests will be able to start their day with our complimentary Express Start Breakfast Bar. Whether you're ready to sit down and relax before you start your day or in a hurry, our breakfast bar offers a variety of choices. House Rules Holiday Inn Express & Suites Golden takes special requests – add in the next step! Holiday Inn Express &amp; Suites Golden accepts these cards and reserves the right to temporarily hold an amount prior to arrival. Holiday Inn Express & Suites Golden accepts these cards and reserves the right to temporarily hold an amount prior to arrival. Please inform Holiday Inn Express & Suites Golden of your expected arrival time in advance. You can use the Special Requests box when booking, or contact the property directly using the contact details in your confirmation. Noisy aircon unit in room. No views, no fan in the bathroom. The bed was too hard and hurt my back. Needs a couple bottles of H2O for the fridge.